Hey friends! Can you believe it's already almost summer again?! If you're a regular at my blog, then you already know this is total Ginger season. I live for these months... those lazy days spent in the pool, endless nights on the patio, and every second in between reading irresistible summer reads. 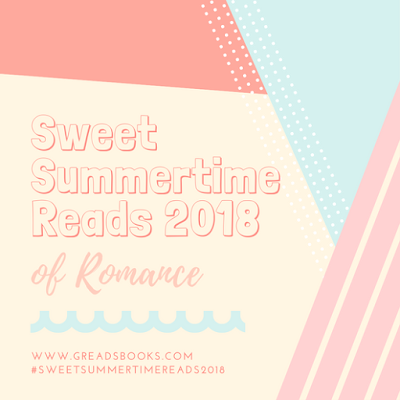 This is my 7th year hosting #SweetSummertimeReads on my blog, a feature that I look forward to every year. It's a place for me to showcase my favorite books to read during the summer and incorporate all things summery. I hope you'll join me this year for all new content! And what might that content be?! I'm meshing two of my most favorite things: Summer + Romance! I decided to dedicate this entire season to romance reads!! How fun is that?! Now, I know that might not be everyone's jam. But... romance comes in so many different flavors. I hope to deliver on all our various tastes. It's going to be great & I cannot wait! In the meantime, let's get through this endless winter (in some parts of our country) together and head right into summertime bliss. So tell me, what are some of your all-time favorite romances? I'm going to offer a giveaway to get this party started! This contest is open to my international friends (just make sure Book Depository ships to you). All you have to do is leave a comment below, fill out the rafflecopter, and you're entered! Good luck... and happy *almost* summer!!! I read a lot of romance books, so it's hard to choose one... I guess "Lord Carew's Bride" by Mary Balogh has a special place in my heart. My favorite romance read is The Choice by Nicholas Sparks! Looking forward to following along! Oh my god yessss summer romances are my favorite. This is what I read most, so it's hard to choose! I love pretty much every Sarah Dessen book that takes place in the summer. Oooh and Nantucket Summer by Leila Howland. Sarah Dessen is one of my favorite romance authors! And summer romances are my favorite. My favorite romance book is Bet Me by Jennifer Crusie. I can't pick just one book, but some of my favorites were written by Christina Lauren, Mariana Zapata and Emma Chase. So I would probably pick one of theirs. I can't pick just one book, but I love reading Sarah Dessen's novels. And I would probably choose something from Rainbow Rowell or Jenny Han. Thank you for the giveaway! I can't pick just one I used to like adult romance but now I love YA romance ones....Kasie West is a great fun read. There is something about a YA romance that makes me feel like I'm in high school again. Even if it is just a few hours, I forget that I am an adult and I have to be responsible. :) Sara Dessen has the perfect summertime romances. My favorite romances are Maybe Someday by Colleen Hoover, Beautiful series by Jamie McGuire, Rosemary Beach and Sea Breeze series by Abbi Glines. My favorite romance is Pride and Prejudice, I think what I love about that one, is the preconceived notions that both of them have to overcome. As for one I'd choose, I'm not sure, I've wanted to read Attachments by Rainbow Rowell for a while now, or maybe Once And For All by Sarah Dessen.